Welcome to another round of giveaways brought to you by MovieGallery.com! We had a frighteningly good time with last week’s Hellraiser giveaway. Pinhead & his Lament Configuration puzzle box have now shipped off to the unlucky winner, who may or may not be trapped in an alternate dimension of unspeakable pain. 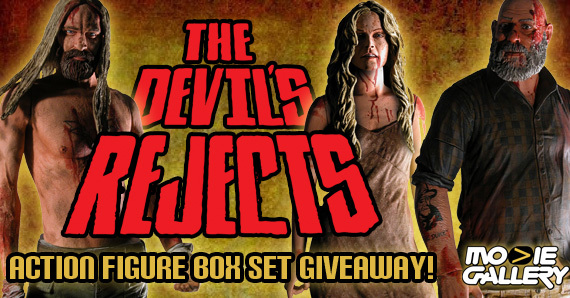 This week we’re giving away a special box set containing three figures from Rob Zombie’s cult horror favorite, The Devil’s Rejects! Read on to see how you can recreate the final bloody showdown in the safety of your own home! 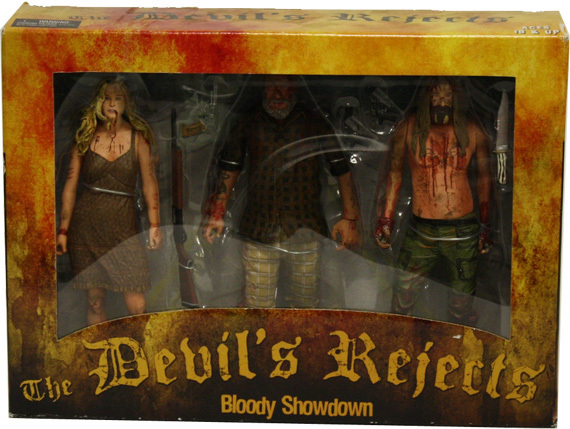 This action figure 3-pack from The Devil’s Rejects includes new bloody and battle damaged versions of Baby, Spaulding, and Otis that can only be found here. It captures the look of the Devil’s Rejects themselves during that final violent moment of the film. Each 7″ scale figure is highly detailed and comes with movie accurate accessories. The window box packaging features detailed wanted posters for all three on the back. This entry was posted in Contests & Giveaways and tagged giveaways, rob zombie, The Devil's Rejects by mgadmin. Bookmark the permalink.